At the beginning of their senior year fifteen thousand semi-finalists get a recognition letter. To be a finalist they are required to write an essay. There is 7 thousand five hundred finalists which averages out to one hundred fifty students per state. 8 of the finalists go to Penn high school. These students are, Amy Bernard, Xi (Chelsea) Chen, Aidan Kaczanowski,Tingyi (Tina) Lu, Corey Wang, Eric Wood, Tianle (Robert) Zhang and PNN’s own Brandon King. 1.6 million applicants, one third of 50,000 high scorers, 15,000 semifinalists get recognition letters, 7,500 finalists, approximately 150 per state. Amy Bernard is a part of English and science academic super bowl, Penn orchestra, TEAMS, engineering, spell bowl, and NHS. Chelsea Chen is a part of Penn’s orchestra, theater, TEAMS competition team, spell bowl, engineering, and math con. She has plans to major in biology during college. Robert Zhang is a part of model UN and has aspirations of going to NYU and doing a dual major of journalism and sociology. Corey Wang is a part of the cross country team, science academic super bowl, TEAMS, Math con, NHS, and was nominated for homecoming king this year. Tina Lu has taken AP chemistry, biology, physics and math & statistics, she’s a member of Penn’s TEAMS competition team, she also has done math & science academic super bowl, and model UN. She has plans to go to MIT and major in applied math. Aidan Kaczanowski is a heavy chess player for Penn and the downtown Elkhart chess organization. Eric Wood has done many activities over the years including, wrestling, football, track, cross country, DECA, and writing for the pennant. 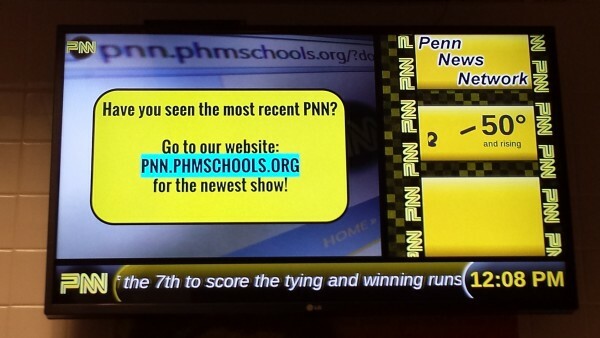 PNN’s own Brandon King has been involved in a number of activities throughout the PHM corporation including, executive producer for PNN, volunteering at the DVT/planetarium, various technical theater roles, and a number of school improvement projects. He plans to attend IU Bloomington next year, and major in international business, with a minor in Japanese. Merit Scholarship awards are supported by some 410 independent sponsors and by NMSC’s own funds. Sponsor organizations include corporations and businesses, company foundations, professional associations, and colleges and universities. There are three options for a scholarship, the NMSC awards 2,500 finalists $2,500 these are awarded on a state representational basis. The second option is a corporate-sponsored Merit Scholarship, a corporate office designates the awards to children of their employees or members, for residents of a community where a company has operations, or for Finalists with career plans the sponsor wishes to encourage. The third is a ﻿College-sponsored Merit Scholarship, officials of each sponsor college select winners of their awards from Finalists who have been accepted for admission. These scholarships may either be renewable for four years of undergraduate study or one-time awards. Winners are selected without consideration of family financial circumstances, college choice, or major and career plans.